Customer Sales Orders can have a blanket percentage discount applied to the full order. Or, it can have a discount applied to each line item. The original and discounted price can be shown on generated paperwork. A default discount can be set for a particular customer and future orders will have that discount applied automatically. Navigate to the unconfirmed Sales Order. Locate the line item in the original order contents that you want to apply a discount to. Enter a percentage discount in the dialog that appears and click "Save" as shown in Figure 2. Navigate to the unconfirmed sale. Select the drop down arrow next to the "cog wheel" as shown in Figure 3. 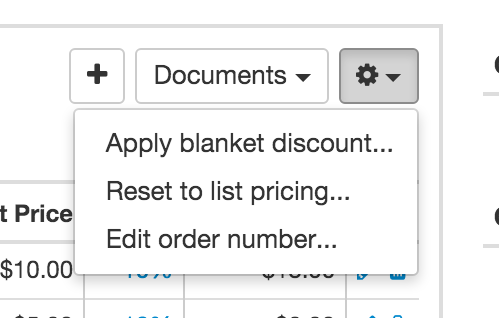 Select "Apply blanket discount..." item from the drop down menu. as shown in Figure 3. Enter the percentage discount you want applied to the full order as shown in Figure 4. Click Apply Discount button as shown in Figure 4. Note: If you have already invoiced for the sale, and you later adjust pricing or discounts on the original order, those changed will not automatically apply to the existing invoice. You will need to delete and recreate the invoice to update invoice pricing. In other words, you cannot add a discount after the invoice has been created without deleting the invoice. You can also create a Settlement Discount on the Order for early payment. See our Settlement Discount Knowledge Article for more information.